In 2001 Mr. Savvy and I went on a trip to Italy. This trip was with a travel club that my husband's employer (a local bank) had created. Oh, those were the days before our economy sank. No more travel club or traveling on bank conferences either. His bank isn't like the big boys on Wall Street, but that is a whole other story that we don't want to get into. lol Now back to our trip to Italy. We traveled to many different cities in Italy in a course of two weeks. We saw many beautiful sites and had some good food and wine, too. One of our stops was Venice . The city of love. Well in March it was very cold and drizzeling. I had on layers of clothes, but I was still cold. While in Venice we went to a factory that makes Murano glass. Here is the link to some information about Murano glass making http://en.wikipedia.org/wiki/Murano_glass . We watched a glass blower make some beautiful glass pieces and then they take you through the gift shop, of course, hoping you will purchase something. 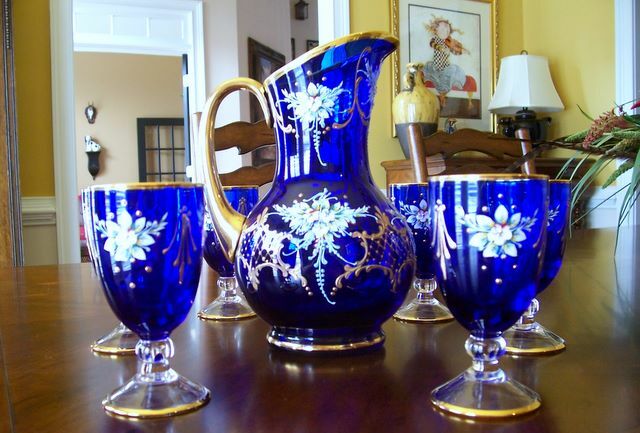 A lot of these items are quite pricey, but we found this beautiful cobalt blue pitcher and juice glass set. Mr. Savvy was so nice to purchase it for me and we had it shipped home. The bottom of the pitcher is even inscribed by the glass blower. It says "for the Nichol's family Venezia 2001". I keep this set in my hutch in the dining room so it won't get broken. If anything does break they will replace it if we just give them a call. 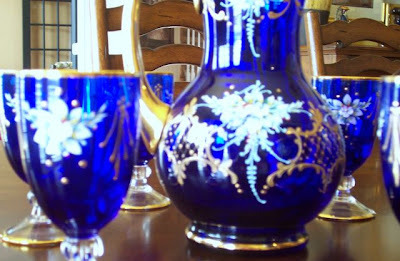 Enjoy these pictures of my Murano glass. All of the details are raised . The gold is 24 carat overlay. 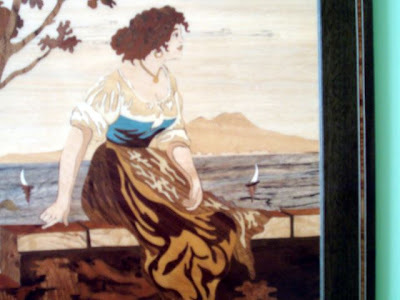 Another stop we made one day was to an inlaid wood working factory called Notturno Intarsio in Sorrento. 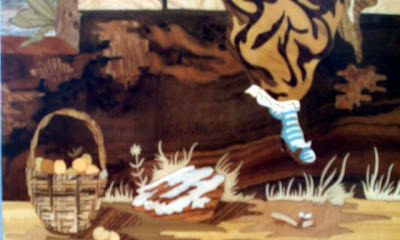 The link to the exact factory we went to is here: http://www.notturnointarsio.com/. They make beautiful works of art. They make artwork, jewelry boxes, furniture, etc. Each piece is meticulously made, which is all explained in the link. 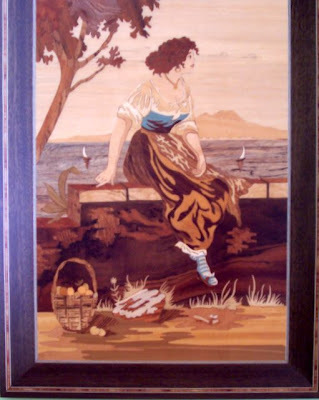 Just click info and it tells you how they make these inlaid pieces. We bought a picture and a musical jewelry box. 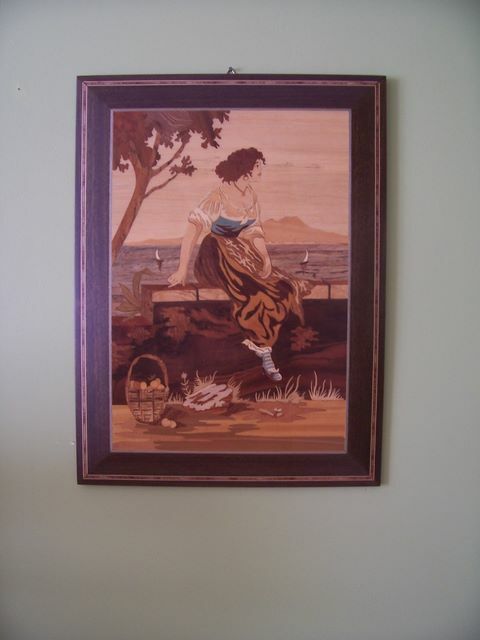 The picture of the lady sitting by the sea hangs in one of the guest rooms upstairs and the jewelry box sits on my dresser. Here are some pictures of these pieces. This picture just seem to grab hold of me and she had to come home with me. Just look at all the details. Each piece are pieces of wood put together to create this piece of art. This is my beautiful little musical jewelry box. The song that it plays is "Torna A Surriento". Each time I play it I am reminded of our trip to Italy. This piece has a very polished finish to it. It is shiny as glass. 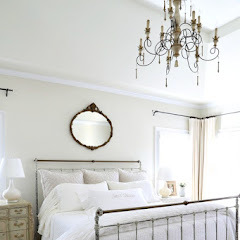 I am linking to http://romantichome.blogspot.com/ for show and tell and to blue Monday over at http://smilingsally.blogspot.com/ . 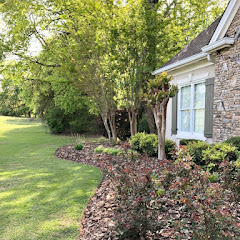 Please be sure to stop by these two blogs by clicking on these links and see what everyone else is sharing this week. I want to thank our hosts, Cindy and Sally for inviting us to participate in these parties. Thanks for stopping in. I love when you come over for a visit. Please let me know you were here by leaving a comment. I do read them all and I want to thank everyone for the gracious comments I have received. I am making many new friends through this virtual world and hope to meet many in person. Great post Kim - I love your treasures from Italy. I have many pieces that were made in Italy in my Etsy store. They are so hard for me to part with, but I can only keep so much. I think I need a bigger house!! Such a stunning set, Kim! What a fabulous treasure to have and display! 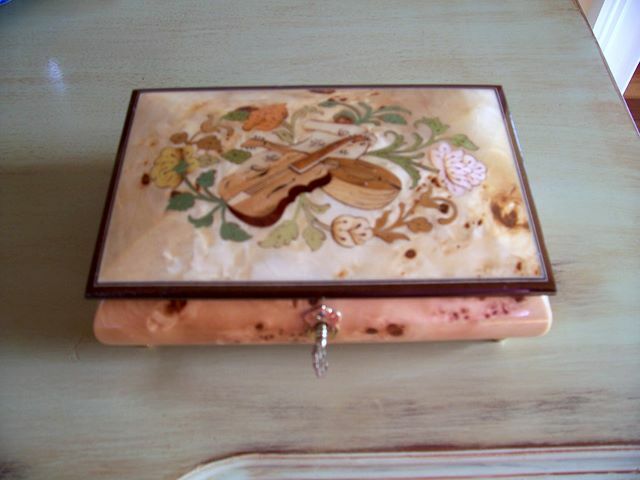 The painting is lovely and you jewelry box is beautiful! Kim, OMG the cobalt blue is beautiful!! What a pretty set! Oh my goodness!! I LOVE the glass! When I went to Venice I also went to several of the places where they do the glass-blowing, and it was really cold outside so the fires inside were so nice. Anyway, I got only one small little piece, and look what you have!! I am SO jealous, lol!! BEAUTIFUL!!!! I love your glassware. We are going to Venice in July to celebrate our 50th Wedding Anniversary. I hope to see the Murano Factory and purchase something. Such lovely treasures from your trip. They are all so pretty. 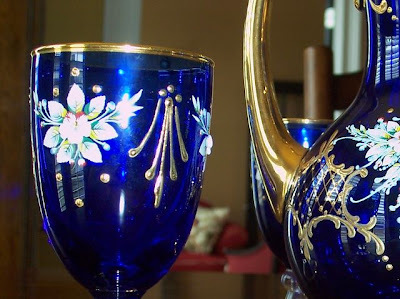 Your murano glass collection is absolutely stunning! I would love to visit Italy....maybe one day! Beautiful treasures! I probably would have had to abandon clothes to make room for dishes in my suitcase. Good morning! Your glass is beautiful! My in-laws lived about 45 minutes from Venice for a couple of years so we went often, and stupidly, I never bought any of the beautiful Murano glass! It is exquisite and your set is beautiful. My gig at the time was a Venetian lace tablecloth. I do love that tablecloth!!! Venice is so lovely at night when all is quiet. Don't you think? That picture is amazing!!!!! Can you imagine the time and attention that goes into that. We brought a grandfather clock home with us from Germany that has some inlaid wood and it is just amazing how they do it! You are absolutely right. Your picture just beckons! Love the cobalt blue color. So beautiful. thanks for sharing. 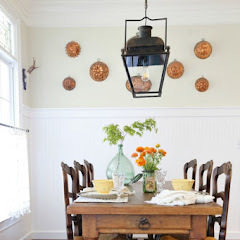 Hi Kim - Love your photos - I noticed the beautiful yellow walls in one of those photos - can you tell me the name / brand of that paint color? 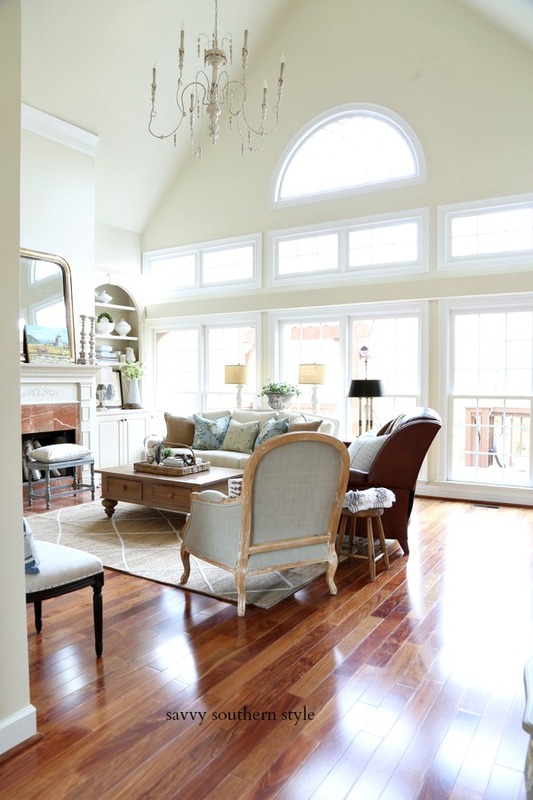 I am a yellow 'freak' and think I would like to tweak the yellow in my living room and that looks perfect! Oh, that glass set is so gorgeous! Wow, the color is just amazing! What nice treasures from your trip! Kim I love looking at your treasures from Italy! 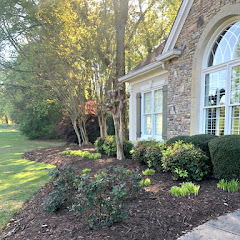 I have some beauties from China and the Middle East and even though they don't fit any decorating style, I think they give our home what I call "depth". Thanks for sharing them with us! 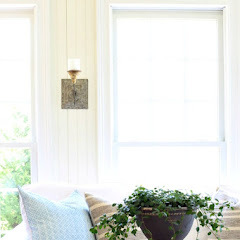 I just got a big shock as I scrolled down the blog list and found mine on there! What a sweet compliment that is, because I love love love your style and am about to put your blog on my list too! We must be kindred spirits! The first set is just breathtaking. Such a lovely shade of blue. Thanks for sharing. a special trip. thank you for sharing? blonde hair, big blue eyes, and a lovely smile. 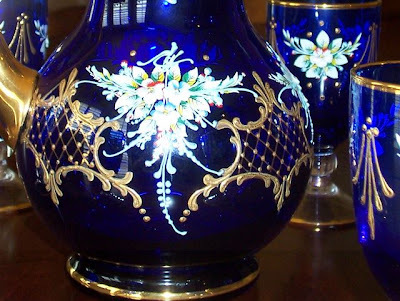 Don't you just love blue glass, thank you for sharing. 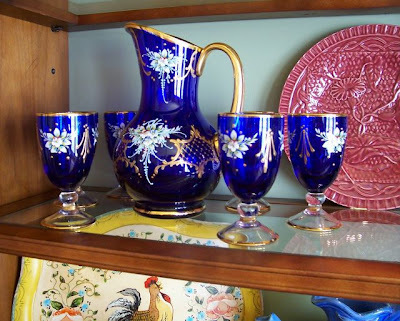 Oh man, I am so coveting your cobalt Murano set! It is very beautiful! What a wonderful trip! I adore Venice, its a Disneyland for adults. Your cobalt blue set is beautiful. I bought a green decanter with matching flutes at Murano. I had my eye on a rose colored set, but at twice the price I decided green would be fine. I lived overseas for 5 years in Dubai, and was a traveling fool for awhile. I enjoyed this post!. It is fun to see where other people have been, and get their impressions of these interesting places. 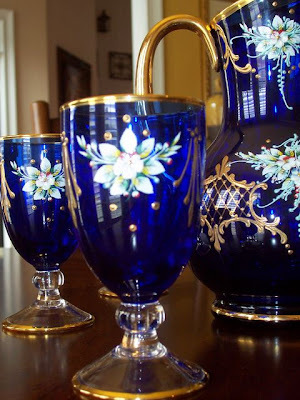 That blue set of glasses and the pitcher is absolutely stunning!! Thank everyone for all the nice comments. They do mean so much to me. The cobalt glass is AMAZING! Your home is AMAZING!! Glad I stumbled into your world. What a beautiful set from Murano!! We were in Venice as well in 2005..I was part of a photogrpahy workshop. So fun! And since we are sailors, we left the Murano stores with a beautiful glass sailboat that sits atop my mantel at the lakehouse!! Did you also visit Lido while in Venice?? Love your blog and your sweet Yorkie is the most beautiful color I have ever seen.